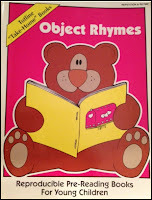 One of my all time favorite therapy resources is the book, Object Rhymes, by Jean Warren. Jean published this book, and many other sought after books, when there were no Internet resources. 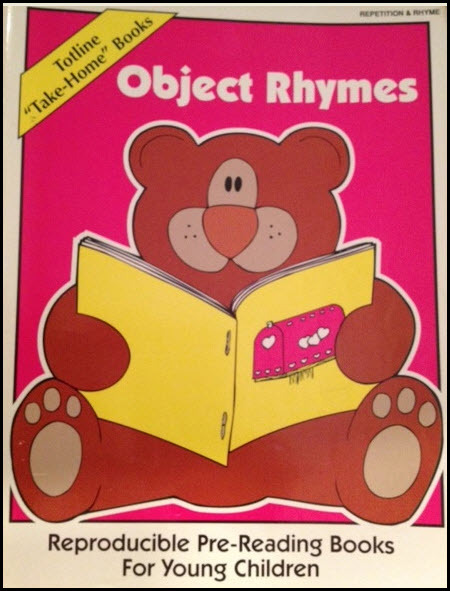 Object Rhymes has illustrated predictable rhymes in book format. You will find rhymes to go along with most of your monthly themes. My early childhood students loved the books. Some could "read" each book and all received a copy to take home. I used props to introduce the rhyme and many of the props (a barn, cars, a house, pumpkins, etc.) became another part of the therapy session. Often with this young population, the goal was to increase utterance length; however, these rhymes could be used to reinforce plural nouns, the preposition "on," articulation, vocabulary, and simple where and what questions. A few+ years ago, my students helped me recreate this rhyme using photographs. 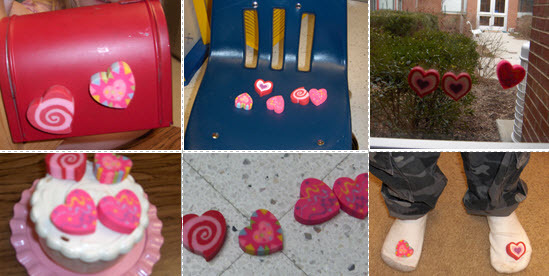 I gave the book the title Hearts, Hearts, Hearts and, with heart shaped erasers from a dollar store, took pictures of the hearts with the items described in the rhyme. I created a PowerPoint using the photographs. Jean Warren kindly gave me permission to post my version of the rhyme as long as it was free so click here to get your copy. It would be much more relevant to your students if you took pictures in their therapy or classroom environment and replaced my pictures. Show it as a PowerPoint, print it as a full sized book, or print the PowerPoint as handouts to make mini - books for your students. As an extension of this activity, use my Valentine Spatial Concepts found at BoardmakerShare.com. 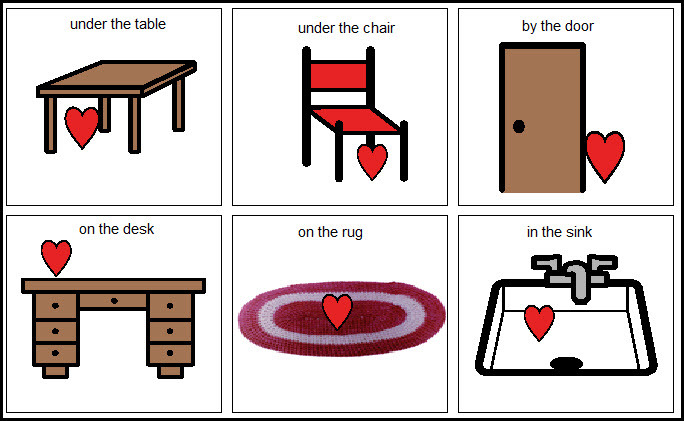 Students choose a card and tell (or sometimes show) where in the classroom they will put a heart. Once the heart is in the appropriate place the student tells another child to get the heart from that location and that child chooses his or her own card and repeats the process. If you have an iPad, Draw With Hearts can be used along with the rhyme (Thank you to Lisa for this idea!). Take pictures of the items (door, mailbox, sock, etc.) without hearts and insert the photograph as a background. Students touch the screen to add hearts to the photograph, reciting "Hearts on the ___." Add new vocabulary by taking pictures of other items in the classroom, classmates, family members, etc. Take screen shots to save the pictures and print or add to a PowerPoint or whiteboard presentation. Thank you again to Jean Warren and Warren Publishing House, Inc. for allowing me to share the activity. Visit her wonderful website, Preschool Express, for many additional learning resources. What a cute app! Thanks for sharing! Thanks! you can also cover a picture with hearts, turn on the broom, and sweep away the hearts to reveal pictures. Multiple Choice Articulation - APP GIVEAWAY!